The Lakewood High Academic Challenge Team continues its legacy of excellence as the varsity squad wrapped up its regular season Southwest Conference play undefeated at 9-0 and then proceeded to also win the conference tournament the weekend after wrapping up its regular season play. The team earlier this year had earned invitations to the Regional Ohio Academic Challenge Tournament and also to the National Academic Quiz Tournament to be held in Atlanta in May. The HSNCT is NAQT’s premier high school event. The tournament is held at the end of each school year and features the top quiz bowl teams from across the United States and from other countries. Over 350 schools will be attending the event. Each month the Lakewood City School District selects two staff members to be honored for outstanding service to the District. This month, the spotlight turns to Lakewood High secretary Deb Groh and Grant Elementary School preschool teacher Cheryl Smolen. Every day Lakewood High Main Office secretary and recordkeeper Deb Groh goes above and beyond to ensure that all staff and students have what they need to be successful. Deb is always the first one in the office and although her starting time is 7 am, you will often find her there even earlier, making sure that substitutes are secured for all absent staff. Ten teachers out for professional development? No problem. A last-minute emergency call off by a staff member? No problem. No matter what is thrown at her, Deb’s response is always the same, "I'll figure it out, might take some juggling, but I'll figure it out." Deb, who joined the District in 2001 and LHS in 2008, always goes the extra mile to make sure alumni calling for transcripts needed for a job or college application receive what they need as soon as possible. These are often frantic requests due to looming deadlines and Deb receives more than 25 of these a week! A graduate may call from over 50 years ago to request an obscure student record and Deb digs like an archaeologist to find the treasured item. Besides her records duties, Deb also manages the mammoth LHS payroll, purchase orders, and myriad staff and administrator requests without complaint. It seems that Deb is always there for whomever may need her. Horizon Education Centers is a leader in quality early care and education, preparing children and families for life for 40 years. Horizon is a mission-driven nonprofit making sure all families have access to high quality programs regardless of income or where they live. Our newest facility, Horizon Education Centers Triskett Station, currently under construction, is set to open April 2019 and is conveniently located at 13700 Triskett Road at the Triskett Rapid Station. We are proud to be one of Cleveland’s top-rated programs. All nine of Horizon Education Centers are rated high quality under Ohio’s Step Up To Quality Rating System. This rating ensures that your child will experience: qualified teachers, proven curriculum, family engagement, developmental screenings and electronic access to your child’s individual learning. Horizon offers programming for children 18 months to 12 years of age. The Triskett Station Center will offer scholarship programs for free high-quality full day preschool for families that qualify. Along with preschool, Horizon offers high quality Kindergarten Readiness curriculum and instruction and the best early care and afterschool educational programs offered in Cleveland. The Herb Guild Garden Club is offering a one-time scholarship available to graduating high school seniors as well as Lorain County Community College and Cuyahoga Community College current freshmen or sophomore students. Applicants must be residents of the state of Ohio and a U.S. citizen. (International or foreign exchange students are not eligible). Only students with a proposed academic study in Forestry, Botany, Horticulture, Environmental Science, Agriculture, Landscaping, or Culinary Arts are eligible for this scholarship. For further information contact Mary Kay Filipiak at 440-926-2469. Picking up from where we left off in my first column, I wanted to share a recent session in our Journey of Discovery that involved the entire staff of Lakewood City Schools during our Professional Development Day in mid-February. It was powerful to have nearly 800 people talking together, all focused on determining the collective vision of what our students need from us in order to enjoy productive, fulfilling, and healthy lives. We thought about how technology has impacted our students in ways we never predicted – both positively and negatively. This led us to talk about how we must prepare our students through nurturing flexibility, adaptability, curiosity, critical thinking, etc., to be ready for technologies that have yet to be created. As part of the discussion, I asked our staff members to share what skills, abilities and habits of mind they thought our students needed to possess to succeed in the world that awaits them upon graduation. What was so wonderful to discover was that the qualities that our staff mentioned were the same ones that have been shared with us during our many conversations with community members at our Listen & Learn sessions and other encounters since the start of the school year. Some of the top qualities mentioned were collaboration, creativity, empathy, resilience, and flexibility, among others. The Lakewood/Rocky River Rotary Foundation is offering grants for study in any accredited post-high school educational institution. Four grants of $3,000 will be awarded toward the cost of one year’s tuition. The Kiwanis Club of Lakewood is proud to be offering its 2019 scholarship program to graduating high school seniors. The club’s foundation will award eight $10,000 scholarships, $2500 per year for 4 years each. Edward Hadaway, Kiwanis scholarship committee chairman said “ eligible applicants can be students at any high school, but must be a resident of Lakewood. They must demonstrate academic success in high school and must have applied to one or more specific college or university. Winners will be chosen based on need for financial assistance; community involvement and service; the qualities of leadership, honesty, loyalty,diligence and participation in extracurricular activities.” Applications and contact information is online at Lakewood Kiwanis. Please submit by April 1, 2019. Kiwanis serving Lakewood youth. The Lakewood City Schools Open Enrollment period for the 2019-2020 school year will begin on March 1, 2019 and continue until March 31, 2019. 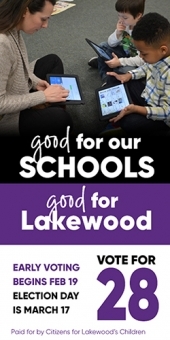 An online form will be available on this District website (www.lakewoodcityschools.org) beginning the morning of March 1, 2019. Notification of Open Enrollment status will be as follows: The first round of decisions will occur in June. Second-round decisions will occur in August. Kindergarten decisions will not be made until August. If you have any questions regarding Open Enrollment, please call 216-529-4203. Michael Jackson, Barack Obama, Josephine Baker, Garret Morgan – these are just some of the names honored as part of Harrison Elementary School’s Black History Museum, created to celebrate Black History Month. Harrison staff members were looking to do something extra special this year for the month of February and came up with the idea of transforming the entire school into a museum. The West Shore Career-Tech District is adding a Sports & Exercise Science program beginning with the 2019-2020 school year. It will be the 13th program that West Shore offers. Cox Communications announced the overwhelmingly positive results of a survey of Connect2Compete program participants, a program designed for low-income families in need of internet access at home. December means holiday concert time at the Lakewood City Schools! From now until December 19, you can catch a concert at the Civic Auditorium nearly every night. Headlining the concert lineup is the wonderful tradition of Sounds of the Season, which will be held on December 13 & 14 at 7:30 p.m. Tickets are $5 in advance, $8 at the door. The magical evening of holiday sounds includes our top high school band, choir and orchestra ensembles with special appearance by some of our Barnstormers Drama Club members as narrators. Members of the Chamber Orchestra, Chamber Choir, Mixed Symphonic Choir, Wind Ensemble and Symphony perform independently and in combined groups both large and small to create an unforgettable evening of music that will have you leaving feeling the warmth of the season! Superintendent Michael Barnes and members of the Board of Education invite the city's senior citizens to a festive, free holiday breakfast at one of our newest elementary schools! The event is Wednesday, December 5 from 9 to 10:15 am at Lincoln Elementary School, 15615 Clifton Blvd. Hear from some of our talented elementary school groups, enjoy great food, and listen to Superintendent Barnes give an update on the District. RSVPs are required by Novenber 28. Please call 216-529-4074 or email christine.gordillo@lakewoodcityschools.org if you would like to attend. Every Northeast Ohioan knows that the most important thing to get you through the long winters here is a warm coat (and a positive attitude!) Earlier this month, students at Harrison Elementary each won the winter lottery as Coats for Kids provided a new coat for each of the 369 students at the school. The donation was made possible by a large donation from the Figgie Foundation. Harry E. Figgie, Jr., and his wife, Nancy Furst Figgie started the foundation to give back to the needy. The Figgies both attended Lakewood City Schools and Harry Figgie is in the District’s Distinguished Alumni Hall of Fame. The Figgies’ son, Matthew, before he died unexpectedly in September, had approached Coats for Kids about donating to a Lakewood school. On October 19, five Lakewood High students and teacher mentors Gray Cooper and Aimee Guzowski traveled to the Wolstein Center in downtown Cleveland for the first session of the First Ring Student Leadership Academy, which is part of the First Ring Schools Collaborative. Participating for Lakewood are juniors, Christopher Brown, Ava Clause, Autumn Cruz, Will Holden, and Aziza Mohamed. The Lakewood Board of Education is seeking applicants to fill a position on its Financial Advisory Committee (FAC), which is dedicated to the District’s finances. Applicants must be Lakewood residents. Emerson Elementary School 2nd grade teacher Dawn Katona spreads joy everywhere she goes. She infuses her classroom with it, she sparks it in her colleagues, and she shares it with every student she meets. Dawn's positive outlook on life, love of teaching, and can-do attitude helps create a joyful and nurturing environment at Emerson and affects everyone from students to co-workers to families. She serves on the PBIS committee that strives to create a positive and respectful school culture among the students and she heads up the staff social committee that brings Emerson colleagues together every month to laugh and share over breakfast and at end-of-year celebrations. She also heads up outreach efforts for families and staff during times of crisis, organizing meals, collecting cash donations and even arranging for bills to be paid. While most of our students enjoyed October 12 as a welcome day off from school for the traditional NEOEA Day, more than 15 Lakewood High School students spent their day leading an anti-bullying workshop that focused on students embracing each other's diversity. Lakewood City Schools' Superintendent Mike Barnes will be holding a series of "Listen & Learn" sessions to listen to what the Lakewood community has to say about our schools. The one-hour sessions will be informal conversations and people are welcome to drop in any time. The first one will be held on Thursday, October 25 from 9-10 am at Blackbird Baking Company at 1391 Sloane Ave. Come and share with Dr. Barnes your thoughts, ideas and concerns for the District. The Ranger Cafe @ West Shore, housed at Lakewood High School will open its doors for business this school year on Tuesday, October 23. The restaurant is operated by the West Shore Career-Tech Culinary Arts program. The students in the program receive hands-on training while operating a real world business. Reservations are required and can be made by calling 216-529-4165, ext. 1. The cafe is open from 12:00-1:30 pm on Tuesdays and Wednesdays. Menu items are homemade and include soups, salads, paninis, quiche, pasta, and fish, to name a few. Prices are super reasonable so go ahead and give it a try! Ranger Cafe never disappoints! For more information, visit the Ranger Cafe website at http://www.lakewoodcityschools.org/14/content/rangercafe. For the second year in a row, a student from the Media, Art & Design program in the West Shore Career-Tech District has won the Teen Driver Safety Billboard Design Challenge sponsored by University Hospitals, Safe Communities Coalition and State Farm Insurance. Congratulations to senior Madisyn Kelly for her winning design! The contest centers on students creating billboard designs that address the issue of distracted teen driving. In 2011 when Katy Corrigan left her job as an RN at Fairview Hospital to become District Nurse for the Lakewood Schools, she did so because she thought she could make a bigger difference working with students. She was right. The health services available to our students that help keep them in school have expanded greatly since 2011, and Katy is a main reason why. When Corrigan started with the District, in-school screenings consisted solely of dental screenings in the elementary schools. Today, all our students have access to not only dental screenings, but vision exams, a medical clinic at the high school, on-site mobile clinic visits at all of our schools, and new this year, in-school flu shots. She works tirelessly to make sure families are aware of these services, many of which families have difficulty accessing on their own. “These services allow a child to feel better and stay in school and that is very rewarding,” Corrigan says. The annual September announcement of the National Merit Scholarship Program recognitions included three Lakewood High students who are among the top academic students in the nation. Seniors Nicholas Cleary, Timothy Daso and Andrew Sheldon were named Commended Scholars by the National Merit Scholarship Corporation. The Cleveland Museum of Art has enlisted the help of 10 educators across Northeast Ohio to serve as Teaching Innovation Fellows. Grant Elementary 5th grade Gifted teacher Sean McGuan has been selected as one of the museum’s Teaching Fellows for the 2018-2019 school year. All teachers strive daily to find a way to keep students engaged in the classroom. At Lakewood High, special education teacher Corey Streets has developed a pet project that has his students excited to come into class every day. On Sunday, October 28, the clear blue waters of the Lakewood High School pool become the coolest pumpkin patch in Lakewood. Children of all ages are invited to splash their way around the pool to find their pumpkin floating in the water. Lakewood has always been proud of its public school system and on September 15, the District was able to show off just why the community has supported it so strongly over the years when Ohio Board of Education President Tess Elshoff spent the day experiencing the Lakewood Way. The Electronic Classroom of Tomorrow (ECOT) robbed Lakewood schools of at least $1.8 million dollars, and some of the politicians on your November ballot took big money to look the other way. If you aren’t familiar with this scandal, here are the facts. Lakewood Citizens: Be on the lookout Saturday, September 8th! From 11 a.m. until 3 p.m., students from the Lakewood City Schools Performing Arts Department will be out and about knocking on doors to say thank you for your continued support of Lakewood City Schools. Additionally, each household will receive a copy of the performing arts calendar for the 2018-2019 school year. The students will extend a personal invitation to these performances. 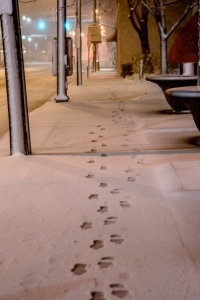 This event, called Feet to the Street, is sponsored by the Lakewood Music Boosters. For more information about the Lakewood Music Boosters and the entire Lakewood City Schools Performing Arts Department visit lakewoodcityschools.org and lakewoodmusicboosters.com.